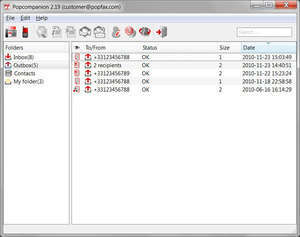 Popcompanion is a telephony tool which allows you to receive faxes on the Internet. While you must create an account to use this service, there are several different options available. When it comes to using Popcompanion on your PC, it resides quietly in your system tray until you receive a fax at which point you'll get a notification. You can also use it to receive faxes via email or to your mobile device. Version 2.30 is a freeware program which does not have restrictions and it's free so it doesn't cost anything. For security reasons, you should also check out the Popcompanion download at LO4D.com which includes virus and malware tests. Additional screenshots of this application download may be available, too.